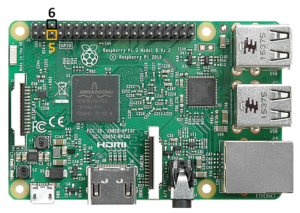 Tired of unplugging your Raspberry Pi to turn it off? You will need to connect a momentary switch from pin 5 (GPIO 3) to pin 6 (GND). Pin 6 tends to be the most convenient ground, but it doesn’t actually matter which one you use – pins 6, 9, 14, 20, or 25 will all work. 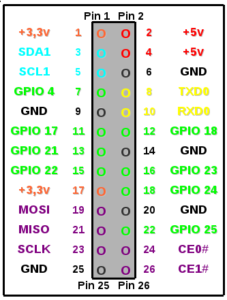 See the pinout if you’d like to use a different ground pin. You can use pretty much any momentary switch that is normally open. You can even use a reed switch for a magnet activated switch to avoid drilling holes in your case! On Raspberry Pi 3, you will need to connect pin connectors (Dupont connectors) to the switch wires, or find a switch that already has them (just an example, not a recommendation). If you need to add pin connectors to your switch, you can solder/splice on female Dupont wires. Or, (especially if you plan to do multiples), you can crimp your own connectors with a kit like this. While, it is *possible* to crimp those connectors with some regular pliers, it’s not really ideal so you’d also want to get a crimping tool. Once you have your switch connected, you will need to install a bit of software to allow the switch to shut down your Pi (pressing the switch while the Pi is shut down will turn it back on without any software.) Your Pi needs to be connected to the internet to download the install script and packages. Hat tips to Barry Hubbard who I believe is the originator of the Python script that makes this work, and to ETA Prime for creating an awesome how-to video that’s popularized this mod. I used ETA Prime’s video to do this initially and realized that the process was more complicated and error prone than it needs to be. So, I created a script that automates the entire software setup. There are two ways you can run the setup script: using a keyboard plugged into your Pi, or over a network terminal session using your computer. Using your computer over the network was the preferred way to do this using the ETA Prime instructions due to the amount of copying and pasting required. However, it’s might be easier to use a keyboard (at least in the UK) for this method unless you’re already set up to connect over the network. Press the start button on your game controller and exit emulationstation to get to the shell. Make sure your Pi is connected to the same network as your computer either via Wifi or Ethernet. For Pi Zero you will need a WiFi dongle. Enter ‘retropie’ as the host name, make sure SSH is checked, and click open. If you are presented with a security alert about the server’s host key, click yes. Type ‘ssh retropie’ and press enter. Host not found / other error? If you get an error like ‘host not found’, you may need to use the IP address vs the host name of the Pi. To get the IP address: in RetroPi select the RetroPi channel and select Show IP. Use the IP in place of ‘retropie’ in the previous instructions. Once you’ve connected to the Pi via SSH, you will be prompted for a username and password. The username is ‘pi’ and the password is ‘raspberry’ (all lower-case). Now the shutdown script should be installed and set up to run every time the Pi boots. To test it out, press the switch. The Pi should shut down. Press the switch again and the Pi should boot up. If your Pi didn’t shut down, shut it down manually. Press the switch. If your Pi doesn’t start up, there’s something wrong with your switch/wiring/connection. If it does start up, wait for emulationstation to load and press it again. If it doesn’t shut down, there’s something wrong with the software setup. A good place to get help at that point would be the RetroPie gaming group on Facebook. Unless required by applicable law or agreed to in writing, software distributed under the License is distributed on an “AS IS” BASIS, WITHOUT WARRANTIES OR CONDITIONS OF ANY KIND, either express or implied. See the License for the specific language governing permissions and limitations under the License. Probably not. PIN 5 is special in that it can wake the Pi up from deep sleep (“off”) so if your RTC board requires it, I don’t think the shutdown script will work. Will this work with an on/off switch not momentary? I’ve written these very vaguely because I don’t have the script on this PC, I’m just going from (bad) memory. But it’s a pretty simple script, you should be able to figure it out from these vague instructions once you see it. Could you please elaborate a bit more? Can I use these with another OS like raspbian? Btw nice work! That´s great, would this work on Recalbox too? I want to turn a out put on when it powers up, (connected to relay, which controls an ATX power supply) and turn pin off when powered down, I have written the to pyton programs, but how do I incorporate into your script to make one run on power up, the other on power down? basically when pi is on want a 3.3v pin going high, when asleep a 3.3v pin going low. Where can I setup a hold time to signal power down? IE: PiCade Hat has a 3 sec hold time for shutdown while a momentary press to start up. Is it something more to do except writing the script. I can’t get it to work the button is not responding. it worked before but not with the timer. Is it something to do with “from threading import Timer”. I am also curious about this issue as I also cannot get the code to work. Any insight or solutions would be greatly appreciated. Hi, I tried substituting your code for the code in the shutdown.py script but I cannot seem to get it to work. Is the way it is depicted in your text box the way I can cut-paste it into the script or are there changes I need to make to it on account of textwrapping in the comment box causing the code to appear other than how it is supposed to look in the editor. Thanks in advance! can you send me that email as well? Thanks in advance! Were you able to get the required information to modify your original script to the one with the delay? Let me know if it works; I haven’t had a chance to test it yet. Unfortunately this does not work so well with the official pi 7″ monitor with touch enabled, since the monitor also uses those two pins for the touch interface. yeah, anything that uses pin 5(the official touch screen and several hifi berry sound cards) require a 2 button approach. just get the shutdown code and change pin 5 to the pin of your choice and connect one button to your new pin and ground. this button shuts down. connect another button to the “run” header on the pi and that will be “reset” or “power on” that button does not require a script. Hi thanks for your idea that seems what I want to do. But I don’t see exactly what you mean by changing pin. Is it possible to have a little draw to show us? Thanks in advance. I’d love to use this on my pi 3 running Libreelec but I can’t install the script automatically due to the sudo command not being used by default. Any ideas on how to overcome this? Great work!!! Nothing happend when i push the button any suggestions? Try editing the script to delete all of the `sudo` commands and then run it. Or, install and setup sudo. Is there a trick to using the button ? I’ve heard that those buttons are often defective or unreliable. You might check that it’s operating correctly with a multimeter or try a different one. You should have to hold the button down no more than 0.5 seconds or so for it to register. this works great! but my fan stays running after i shutdown… anyway to get the fan to turn off as well? My pi wont stat at all after installing the script. i can see power light on the pi but it just wont do anything, no picture or sound, just nothing. can you check that your sd card is working (check on your computer) and inserted properly? what distro? retropie? what version? When I plug in a keyboard and type the commands, it doesn’t recognize the url. Am I supposed to be connected to internet, even for the keyboard method? I have a Pi Zero without wifi. If you need to be on wifi, why isn’t that in the instructions? OK, once I figure out how to go online, I’ll try again. For the keyboard method, once I type the script, does it automatically go online and download what it needs? Sorry, I’m a complete idiot when it comes to this. Never used linux before I got the pi a few days ago. I’m on NOOBS Jessie, not retropie. Will the script work, and can’t I just short the two pins manually with a screwdriver or similar (0.5s contact), instead of “installing” a commercial switch? What is the startup state when you plug in the usb power?.. I’m interested in making this project, but if the startup state from plugging in is ‘switching on’ without pressing the button it is kinda useless for me.﻿ I frequently unpower my pi. The initial power state is on. I’m not sure if that behavior can be changed; I’m guessing no. Why do you frequently unpower and repower your pi? Hi 8bit, I have all my multimedia hardware set up on a powerswitch, so my speakers and stuff don’t use all the power all the time. Cost and wear effective and all… I don’t always use the pi for watching TV. Sometimes I use a ChromeCast and there is no reason for the pi to be on. If the startup state would’ve been off then I could use it as a separate power switch. I could however use it as an off switch. +1. Would be best for me too if had to press to switch on after say a power loss. Don’t want it switching on unless I press button. The script wont install for me. I receive an error that the certificate from the host is not recognized? Nothing installs and there is just a line of zeros above the error? Any help? I’m not sure why, seems to be working ok for me. It only works if the HDMI is plugged in. If i try power up without HDMI it tries to boot but shuts down within ten seconds. That’s odd. Are you using a “borkin” button? What kind of button are you using? I use the 7″ display and I get the same issue, it powers up and 10 seconds later it turns down, I have other 2 raspberries where it is working without issues. Have you found out a way to fix this? shared a link to this awesome guide in my video, thanks again! Finally! Other methods I tried either simply did not work or caused RetroPie to not boot properly. Im having problems trying this two different ways. I installed the wire and borkin button with no problems. Followed ETAPrimes video. 1st version problem using putty – When I use Putty I enter the ID and PW correctly then the green indicator in the command window moves down one line and nothing happens. sounds like your pi isn’t connected to the internet? My setup is a straightforward Retropie installation (C64 Breadbin mod) with no GPIO connections so pins 5+6 are available and work as above. Used the putty ssh and script set up with no issues. The script worked flawlessly on my Raspbian Jessie. Just now i formatted the microSD card and installed Raspbian Stretch from scratch, followed by sudo update&upgrade. Rebooted. And then installed the script. The script does not seem to work any longer, since i am on Raspbian Stretch. Please could you check? After a reboot, the script doesn’t seem to be active. So when i enter “sudo python /home/pi/scripts/shutdown.py”, i get the output “/home/pi/scripts/shutdown.py:11: RuntimeWarning: A physical pull up resistor is fitted on this channel! GPIO.setup(5, GPIO.IN, pull_up_down = GPIO.PUD_UP)”. Maybe this helps for trouble shooting? I updated the scripts. Try running it again; should work now. It only works after installation. After first reboot, doesn’t work anymore. I am using Raspbian Stretch on Pi 3.
i’ve reinstalled the (new) script. no change. only works after installation (1st shutdown, and then 1st reboot). after the 1st reboot a 2nd shutdown doesn’t work. what happens if you “sudo python /home/pi/scripts/shutdown.py” ? I’m currently building a setup that will be using two original SNES controllers via the GPIO using the gamecon_gpio driver and it uses pin 5 and 7 for the controllers. what and where would i have to change your script to use, say Pin 40 (GPIO21) and 39 (GND)? Sorry, I’m pretty new to using the GPIO pins for anything on a Pi. …whilst in SSH then the Pi3 will Power Down as scripted. I’m a H/W guy and have read this whole thread. A friend and I are working with a Pi3 with HiFiBerry HAT. My first question is why was GPIO3 (pin 5) chosen to be “special” as in toggling that pin while the Pi is asleep wakes it up? GPIO3 is the SPI bus Clock signal used along with GPIO2 (pin3) SPI bus Data to query a HAT’s EPROM for its identity so those two are automatically “stay-away” pins when a HAT goes on. Seems like an odd choice. Is that GPIO3 wake-up function cast in stone? Second question is that I see Off/On gizmos for sale at Mausberry that require a (HAT-less) connection GPIO23-24 (pins 16 and 18) and apparently the gizmo comes with a script. Button presses not only initiate a soft shut-down but also wake the Pi up. How does that work? Who’s watching those pins while the Pi is sleeping? Or am I missing something? Thanks for any education at all. 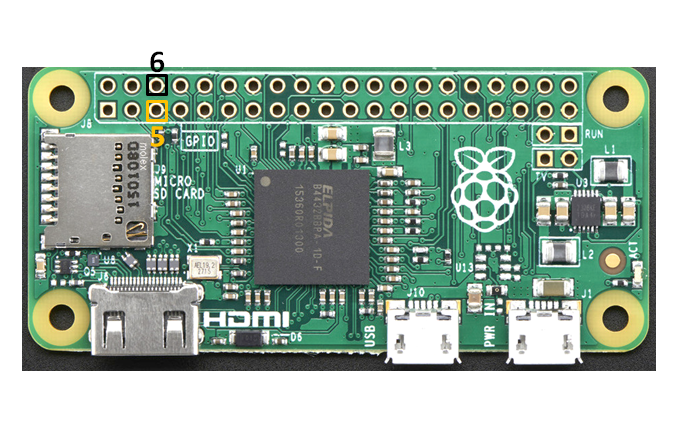 pin 5 was chosen by the raspberry pi firmware developers. if you google hard enough you can find a little bit of info about it including in some developer forums where they talk about it- it was a feature they added later on in the cycle. Sorry, I don’t have any links handy. the research I did do seems to indicate it would be possible to modify the firmware to change that pin but that may be pretty complex to do. and, I haven’t been able to find specific enough information on where that code is or how you’d go about picking a different pin, or how the firmware flashing would actually be done. the mausberry is basically a relay in front of the power to the rpi. to turn it on, if I recall correctly, it simply allows power to flow to the turned-off pi which causes it to boot. there is info on the mechanics behind the mausberry online (maybe including code/design files, can’t remember). “home/pi/scripts/shutdown.py:12: RuntimeWarning: A physical pull up resistor is fitted on this channel! It was suggested I add GPIO.setwarnings(False) to the script before it starts defining the pins to ignore the warning, but that has not affected it in any way. I’m in way over my head when it comes to scripting, so I have no idea where to go for troubleshooting that. sorry, I’m not sure. A few people were having this problem when retropie moved up to a newer version of raspian. at that time I modified the script to fix that, but it seems some people are still running into it. are you using the regular script or the version for the nes pi case? what version of retropie? you might try asking in https://www.facebook.com/groups/726218244186933/ They are better at keeping up with things than I am currently. I’m running lebreelec on pi3. The wake function is working but not the shutdown. Is there as easy way to uninstall/delete the script to start over? Once the shutdown script was installed, the joystick stopped registering events in `jstest`. I tried just commenting out the init script for the shutdown daemon which didn’t help, then I uninstalled the Python modules which still didn’t help, and then I reinstalled the `snesdev` driver and the stick started polling events again. Maybe I can install the Python modules and then reinstall the `snesdev` driver to overwrite whatever stomped on the driver, I don’t know. Just curious if anyone else has run into this? Im curious..I have a HAT sound-card on top of the PI3. The sound-card supplies power to the Pi. I could add the button to the sound-card except I need the headphone jack for my headphones. Is there another way I can install this button and get the Borkin button to turn off the PI? Is this script looping every 0.5 seconds to check if the pins are bridged in order to perform the safe shutdown? Having the same problems mentioned above.. only working to startup not working to shutdown.. any solutions yet on how to get it working? I have built a couple of Retropie systems in the past, and this setup script has worked first time. Does anyone know which startup or rc file is responsible for running the file /etc/init.d/pi_shutdown? Using putty will allow you to copy and paste the line, thus avoiding typos. Reboot the Pi and run ps -aux|grep shutdown to confirm whether or not the script is being run. This workaround worked for me on my Pi 3 B+ running Raspbian Stretch. @ElShiftos my man!!!! you are a god among men, thank you for this solution. So, here’s my problem. I have a NesPi case and did the ETA Prime mod. It gets up to the RetroPie splash screen, then shuts down. I tested the power and on the pin 5, it measures 0.0v until I press the reset button, then it goes up to 3.3v. I’m assuming that’s what it’s supposed to do. Thanks! This worked or my on Raspbian. Thanks heaps! Works perfectly with RetroPie v4.4, then SSH via Putty on Windows 10. Connect momentary “mini spring button” switch to pins 5&6. Reboot and worked like a charm for me 😉 Cheers 8bit! Sorry correction, my version of RetroPie is actually v4.3.5. but still very happy this works – looks like I might hold off going to v4.4 for a bit. Wow. For the first time in my life trying something like this, it worked first time. You sir, are a genius. Thanks for the share. hey so dose this still work with the 3.5mm headphone jack? if not is there a way to get it to work? Hi, does the script work on a computer with Raspbian (octopi)? I will not want to put a script that disfunctions my Raspberry. (raspberry 3B+) Thanks a lot for your answer. Is it possible to change the pin by editing the script? Where then is it located…? Hi, 8bit! I successfully installed the program, it shut down and powered on successfully! But after the first button caused auto startup, the shutdown function no longer works. I did saw the same problem you mentioned in the article, you told us to go to facebook and ask them. I sent the request to them, but I’m not in yet. Do you know how to solve this problem? Thanks! I tried this on/off button implementation on my two Pi’s and it is working just fine. It was not quite as easy as expected. One Pi (and older B+ model) is running DietPi and I did have to tweak the shutdown script as I was getting a “a physical pull up resistor is fitted” error. I had to remove the “pull_up_down = GPIO.PUD_UP” argument from the “one button to rule them all” function call. The other Pi (a new 3 B+) is running Raspbian and I had to manually add the line to run the shutdown script to the rc.local file. So, now upon reboot, it will run that script. Do you mind guiding me step by step after install? This is marvelous! Thanks for the work, we now have shutdown on our RPi 3B+. If it doesn’t work for you a second time/after a reboot, the solution Justin posted above worked for me and is here for your convenience. Thanks 8bit and Justin! Why wont this work on a Pi running Octoprint? This is great! Thanks for the guide. I installed it today and came across the same problem as Chris c Krimtisos. The button worked once, then after reboot nothing. Came here, saw last comment has same issue, reading more comments I saw Justin mention that the script no longer works with 4.4 raspbian unless you add it to the rc.local file so it can be started on boot. This makes the button work after reboots. Hope this helps some future people getting this button to work, it’s totally worth it! So simple and inexpensive. Oh and if you are scared to solder in case of perma ruin, use a glue gun. I picked one up at the 1$ store and worked like a charm!! Thanks again to the people who figured out how to do all this!! The one issue I do seem to still have is that the button doesn’t work unless the monitor is plugged in. I don’t know if this is normal or not, can the button be used on a headless system? I was putting on my pi-hole that doesn’t have a screen attached. The pi seems to boot up, read light flashes, then the nic flashes, then the nic lights shut off and I cannot reach the pi via ssh. If I plug the screen in and press the button the pi boots up as normal. Anyone know if it is possible to use this type of button/script with a headless pi? I figured out how to use with a headless pi, for those wondering you have to have hdmi_force_hotplug=1 set in the /boot/config.txt this sets the pi to use HDMI mode even if no HDMI monitor is detected. @Randy, Thanks I could not figure out why my pie wouldn’t shutdown. I also had to add the file to the rc.local file. My pie would start up but not shutdown with the button until it was added to the rc.local file. Thanks! 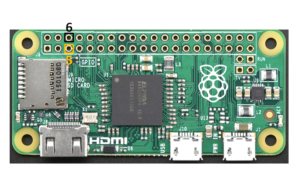 RuntimeError: This module can only be run on a Raspberry Pi!
? Anyone know how to modify it on a different distro? It still does not shutdown when pressing button. It boots up from a shutdown (still powered) state so I know that Pin5 is going low when pressed. Then it shuts down properly. Somehow rc.local file is not enabling the python script. This script is working to shut down and restart, but it is not saving my favorites or last played. I just briefly skimmed the other comments and didn’t find my same issue. I’m sorry if I missed it but can someone point me in the right direction? 8BITJUNKIE.NET IS A PARTICIPANT IN THE AMAZON SERVICES LLC ASSOCIATES PROGRAM, AN AFFILIATE ADVERTISING PROGRAM DESIGNED TO PROVIDE A MEANS FOR SITES TO EARN ADVERTISING FEES BY ADVERTISING AND LINKING TO AMAZON.COM. SOME LINKS TO PRODUCTS ON AMAZON.COM OR OTHER ONLINE RETAILERS, INCLUDING LINKS TO RECOMMENDED OR REVIEWED PRODUCTS, MAY RESULT IN A COMMISSION BEING EARNED. WHILE THIS DOES NOT IMPLY UNDUE BIAS IN RECOMMENDATIONS, THIS STATEMENT IS GIVEN IN THE INTEREST OF FULL DISCLOSURE. AFFILIATE PROGRAMS AND AFFILIATIONS INCLUDE BUT ARE NOT LIMITED TO THE EBAY PARTNER NETWORK.